The Church of Jesus Christ of Latter-day Saints (the Mormons) is renowned throughout the world for its humanitarian efforts, the strong work ethic of its members, their adherence to a strong moral code, their dedication to family, and their loyalty to their communities and nations. But not unlike any large religious organization, the church has espoused practices and doctrines that were received critically by those same communities and nations. Among these, the best known is the Mormon belief in polygamy. Polygamy, also known as plural marriage, is by no means unknown to the world. Christians have long debated Biblical polygamy. Arabic and far eastern harems have long been the subject of exotic fiction. From The Arabian Nights' Ali Baba and the Forty Thieves to Rodgers' and Hammerstein's The King and I, the idea of a man having multiple wives fascinated audiences—until it happened in their own back yard. Beginning as early as 1831, Mormon prophet Joseph Smith and other early church leaders began marrying multiple women in obedience to their belief in a revelation they claimed came from Jesus Christ. From the moment their actions became public knowledge in the 1840's, religious organizations, local communities and the U.S. Federal Government actively worked to stop the practice, even if it meant destroying the church. From that moment on, the Mormon doctrine of polygamy was elevated from the odd practice of an obscure American religion to a plank in political platforms—affecting the lives of hundreds of the nation's leaders. Today polygamy is practiced by many people including Mormon fundamentalists, Christians, and Muslims. Polygamy can be found in 78% of the world's cultures and is hotly debated in Christian congregations and political rallies throughout the United States, and its decriminalization or legalization in Canada seems to be only a matter of time. Join us as we discuss the amazing enigma of Mormon polygamy. 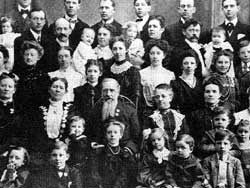 Throughout this website you will find considerable information derived from E. Keith Howick's Polygamy: The Mormon Enigma. Queries may be submitted to Mr. Howick through the contact page.